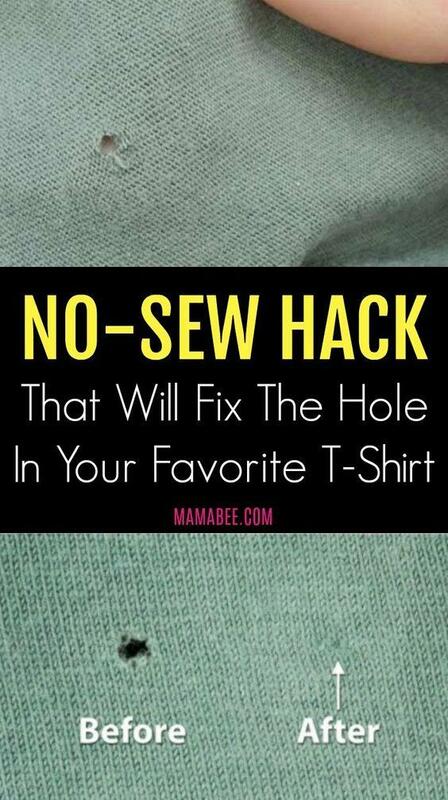 Stop what you are doing because this no-sew hack will fix the hole in your best T-Shirt. We can be clumsy and careless sometimes. The worst thing is when you don’t remember when you made this hole. You can wear it without noticing until it catches the eye of your friends or family. Wait. Don’t throw it away right away. I think I have the solution for this problem. No, I won’t tell you to sew it because that fix is still vivid. It’s time to repair the garment and bring it back to a wearable condition. It will take you 10 minutes, but you are going to love this no-sew hack. The host, Toya, will explain everything you need about this method. The no-sew hack is easy, and I bet you will try it on all t-shirts available in your closet. If you don’t have any, you should bookmark this video for just in case something like this happens. Top tip, close zippers on clothing before putting items in the washing machine. These holes are likely caused by open zippers catching on clothes in the washer and dryer. Thanks Deb- I wondered where they came from. I truly didn’t know. From now on I’m checking zippers!! Thanks for a concise and great solution to a problem happening constantly when we wear our shirts untucked! Your pictures and explanations are excellent and right to the point. Sorry, but I can do it better. Normally you do not see anything on the right side. I use a thread of the same color and I just reconstruct the missing thread and mesh. When it is very small I use a magnifying glass. I think mine come from bras not being closed too. Nope! The holes are almost always on the same are. It’s from your seat belts in the car rubbing on the shirt with the button or belt buckle of your pants is underneath. I lift my shirt over, and no more holes in my shirts. The post said there was a video. There wasn’t. I saw the list of what you needed and a before and after picture. Do I guess or continue with my usual old way of fixing it since no instructions given..